Super structured Product Information Management (PIM) is core if you are doing any kind of serious e-commerce. A headless approach means that you have a service ready to manage product information management in seconds. Product content is delivered to you via an API. No templates, no webpages, only structured content. Just pure developer bliss. The development of front-end technologies is moving at a staggering speed. With an API driven e-commerce back-end you ensure that you always stay cutting edge in the front-end. You are not slowed down where it matters, where you build the shopping experience. If you prefer building your web based front-ends in React, Angular, Vue.js or your native Apps in React Native, Flutter, Ionic does not matter. You are free to choose, experiment, evolve. Just build great shopping experiences. A solid product information management service will allow you to define products in any shape. Keep them structured and organized. You need to be able to manage rich content including pictures and HD videos. PIM as a service means that you have a cloud based service that is available at the push of a button and scales with your growth. You have no server management, no database management, do not think about backups and oh - predictable costs. All the back-end pain points have been removed. This leaves you in the sweet spot of being able to buy PIM as a commodity service and you can focus your efforts on building innovation. You can focus on the core business and continuously optimize the shopping experience for maximum conversion and customer satisfaction. Product structures are complex by nature. You are managing structured products of many shapes. They are organized in a complex tree or grids. When building a shopping experience you typically end up with scenarios like fetching five apples, two oranges and the three latest cooking explainer videos. This is where REST falls short, REST is typically designed to give you apples or an apple - not apples and oranges at the same time. REST is single resource focussed. GraphQL is designed for this scenario, to get many resources in a single request. One query to fetch complex structured data with multiple resources. One round trip to the API. Lower latency. Ask for just what you need. Transfer only what you need. Smaller content transfer chunks. 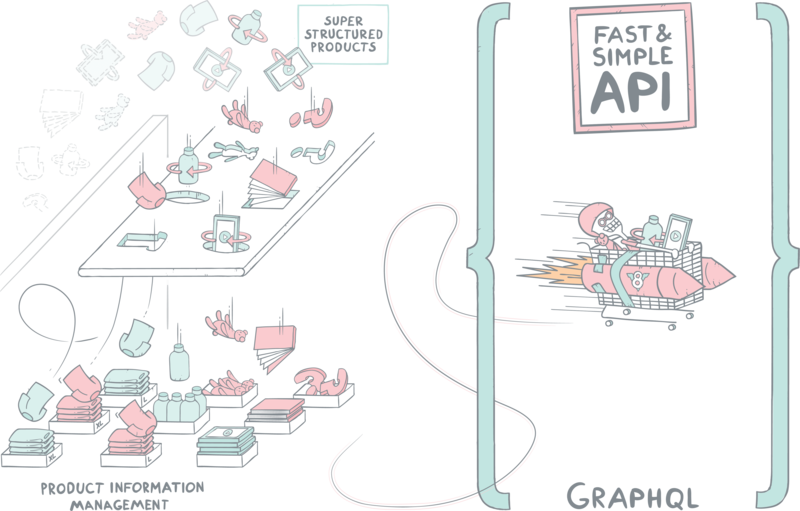 GraphQL describes what is possible with the API. One endpoint to your complete service. Faster developer ramp up and less errors. GraphQL done well makes for a super fast API. Check out our approach to headless PIM. You can play with the GraphQL API directly on the site. Live. No cache. Just a fast and easy to use API.